Participants who qualified the first Online Qualifier Round are eligible to take part in this round. Please note that participants who have qualified Round 1A can only participate unofficially in Round 1B. Users are ranked according to their score. 14:45 IST, 31 OctThe teams in top 1500 ranks in Round 1A and those who scored >= 350 and above in Round 1B will be directly ported to the Pre-Elimination Round. In addition to this, they will also receive an official email. The eligible teams do not have to register again. Please note, the teams who will be caught under plagiarism for Round 1A and Round 1B will be disqualified after the Pre-Elimination Round. 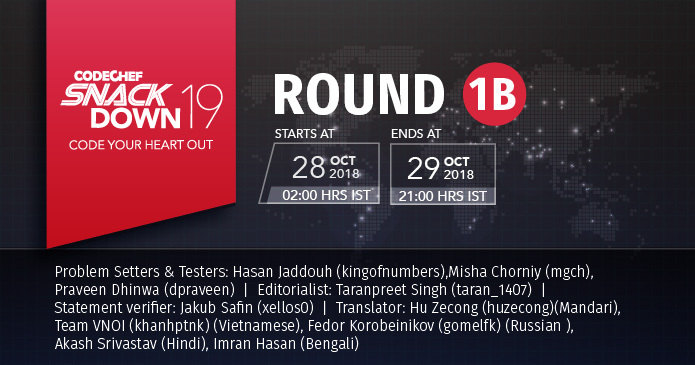 21:00 IST, 29 Oct: The SnackDown 2019 - Online Round 1B has ended! 2:24 PM IST, 29 Oct: All teams scoring >= 350 in this round will qualify for the Pre-Elimination Round. That is the current cut-off, and so to not disadvantage the teams who are unaware of the extension of the contest, we are freezing that as the cut-off. 1:39 PM IST, 29 Oct: The contest has been extended by 7 hours. It'll now end at 21:00 IST. This has been done because the Registration Timer had been set till 9pm by mistake, and many teams assumed that the contest has been extended due to that. 7:35 PM IST, 28 Oct: We have fixed the ranklist issue, teams which are participating unofficially (who have qualified for Pre-Elimination Round) in Round 1B will no longer appear on the ranklist. 5:15 PM IST, 28 Oct: All the teams including those who have qualified for Pre-Elimination round (who are unofficially allowed to take part in Round 1B) are also appearing on the ranklist. We shall soon incorporate the changes on the ranklist and update everyone here. 02:40 AM IST, 28 Oct: There was an error in the Sample testcases of QUEUE2. They have been fixed now. Sorry for the inconvenience. 11:40 PM IST, 27 Oct: The contest has been postponed by 2 hours. The contest will now begin at 28th October 2 am and will end at 29th October 2 pm. We regret the inconvenience caused. 10:10 AM IST, 21 Oct: Teams which have qualified for the Pre-Elimination Round from Round 1A can participate unofficially in this round. That is, they can participate, but they will not appear in the ranklist, so as to give the other teams a chance to qualify. Note: All the submissions for Round 1A and Round 1B will be put through MOSS for plagiarism detection (this will be done post Round 1B). Incase, if any team is caught in cheating then their qualification to further rounds would be revoked.